Thanks for all your interest and loyalty. We hope to get back up and running sometime in the future. Please note that we will no longer be able to respond to wish@thecupcakefairy.com.au emails. Under construction... we currently have equipment and supplies to order. While we get this page up and running please email wish@thecupcakefairy.com.au or call us to order anything you need. 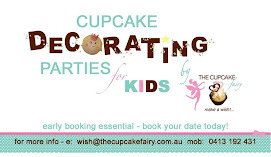 CUPCAKE, CAKE, COOKIES, & OTHER CLASSES are held in the Eastern Suburbs, Sydney with The Cupcake Fairy. We have many years of teaching and training experience... we make sure you learn techniques and skills that you can then replicate after the class. Don't go home with 12 of the same cupcake! Take home cupcakes with a dash of your own style and personality. Classes allow you to be you or just follow along if you prefer. NO NEED TO BRING ANYTHING - everything is included in course cost - tools, equipment, etc all organised for you.... just turn up with your smile and your camera of course! Always wanted to learn how to do the 'swirly icecream' topping? Or wondered how to make the fancy 'flat fondant' ones? Flowers, bows, embossed butterflies and embossed cupcakes too? Monogrammes? Wonder no more and come to a fun, relaxed, informative and very hands-on Cupcake Decorating course. The Cupcake Fairy will show you the secret to creating "ooohhhh" and "aaahhhh" cupcakes you can make for your next celebration. You will leave the course with 6-10 beautiful, hand decorated cupcakes. All equipment and ingredients included in course fee. Enjoy a cuppa and a cuppie, meet other 'cuppie crazy' people like yourself and most of all have fun and learn the secrets to the cupcake craze. Email wish@thecupcakefairy.com.au to book. So you can create the swirl and the flat fondant look from Cupcake Crazy 1. Come along to develop your skills and learn to make wired decorations for added height and impact, and create a "SURPRISE" cupcake on an iced board, butterfly garden, create a ‘baby face’ cupcake, make toppers using moulds and MORE! You will take home at least 6 decorated cupcakes with amazing toppers. All the elements of Cupcake Crazy 1 and Cupake Crazy 2 above in a 1 day class! Learn to prepare and cover a round cake in this hands on class. You will get to choose part of your own design before the class! You get to take home the cake that YOU want - not one chosen for you! The Cupcake Fairy will help you modify your chosen design to match your skill level - even if you have NEVER covered a cake before. FUN! FUN! FUN! Join in the fun of learning to decorate a square present box in this 1 day class. Includes stenciling with royal icing. 2 days PACKED full of learning outcomes - preparing and making a 2 tier cake, construction for safe transportation, covering a taller, elegant top tier, stacking, STRIPING THE BOTTOM TIER! please note: Due to unforseen circumstances, the dates, times, content, class sizes and prices of all courses are subject to change. If you have booked and a course is cancelled or changed you will be notified and offered a transfer or a refund. Thankyou. Regular Cupcakes from $3.75 (minimim 20). TOP CAKEs - for the top of the cupcake stand a 6inch cutting cake is recommended - starting at $55 depending on the decoration, detail and covering required. Please call or click on link or email to determine your costing - we always endeavour to respond asap and usually within 24hrs (technology permitting!) Please detail what kind of cake you had in mind and how many guests you are serving. We bring the cake, the icing and the FUN! or you can make a selection from lots of themes. - Hassle free entertainment & the children learn so much too! - So much more than just lollies and sprinkles! SMS "Cupcake Party Info" to 0413192431 with your return phone number and the Cupcake Fairy will call you back to discuss your party personally. Freckles Invitations - Innovative Invitations - MUST SEE!